Do you have an idea that’s ready for Hollywood or that you think might make a winning indie film? Our writers understand the craft of screenplay writing and what it takes to entertain an audience. Hiring our professional screenplay writers will increase your chances that a movie producer will pick up your script. Find out how we can help your screenplay come to life. Just fill in the form on this pageto let us know what kind of screenwriting help you need. Tap or click to read more about how a screenplay writer works. There is no rule that we have to go through all five steps. We can work from your logline, from your treatment or from your outline. Or we can combine the first three steps in a mish-mash of brainstorming. The finished script will reflect whatever input you provide in writing, by email or over the phone. Whether it is action or comedy or romance, our goal is to make you proud of your screenplay. Why hire a screenplay ghostwriter? There are many reasons for hiring a ghostwriter for your movie script. These are some of the reasons that motivate people who have come to us. Tap or click to read more reasons to hire a screenplay writer. People with a great imagination can envisage their stories on the big screen. But screenplay writing is a special craft. Come to us to help turn your ideas and visions into reality. People hire screenplay ghostwriters when they are in a hurry. Screenplays are almost always a labor of love. Our clients typically have demanding jobs, and they don’t have the time to write a screenplay. In fact, they rarely have time to figure out how to write a screenplay, which is very different than writing a book manuscript. What we offer you is a head start. Our screenplay writers know exactly what to do. When you hire our screenplay writing services, you skip past the learning curve. We get straight to writing. Get ahead with our screenplay writers for hire. Our clients hire our screenplay writers to get organized. How do you organize them all? You are not the only cinema visionary with this question. We offer a simple solution. Find film script writers for hire from our team. We’ll get you organized. Many people hire a screenplay writer for her expertise. This is the top reason people come to use. They have an idea. They might even have a full story written out in novel form. But converting it into a movie script is something altogether different. For that, you might need a professional screenplay ghostwriter. We can structure and format your screenplay, complete with dialogue, narration and other elements required for film. Let our skilled screenwriters turn your vision into a manuscript you can be proud of. How to find script writers for your movie. We have screenplay writers for hire. For a free quote on ghostwriting your movie script, whether it’s action or romance or comedy or fantasy, tap or click the red button to the right. Many storytellers come to our ghostwriting agency to find a writer for their movie manuscript. There’s a difference between writing your own screenplay and outsourcing the work. Your ghostwriter will need to get inside your head, to understand your vision. You’ll have to give precise instructions so that the scenes turn out exactly how you envisage the story. These tips will help you get the screenplay you need for the film you’ve been imagining. 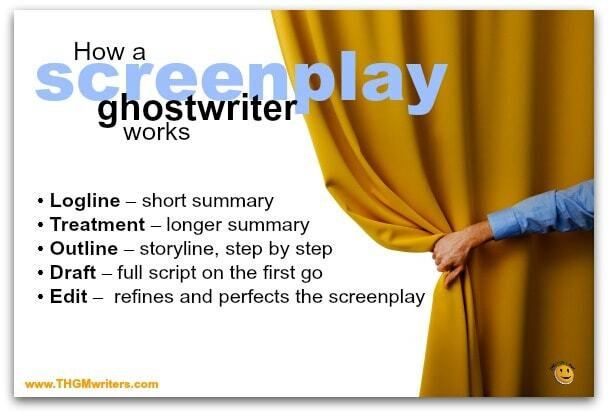 Tap or click for more tips on how to work with a screenplay ghostwriter. List all the settings for the action. One of the first things your ghostwriter will need to do is describe the settings. These typically are rooms or outdoor scenes. Each scene will have its own setting, although some scenes might have more than one, such as when one character pushes another through a window. These settings will have to be described in detail. If the details are important to you, your ghostwriter will need to know. If they are not important, say so; your ghostwriter will make them up to the advantage of your story. You might not have all the twists and turns figured out, but you probably have the broad strokes. And you might have many or even all of the details. Whatever you have, whatever you want in the final screenplay, make a list. 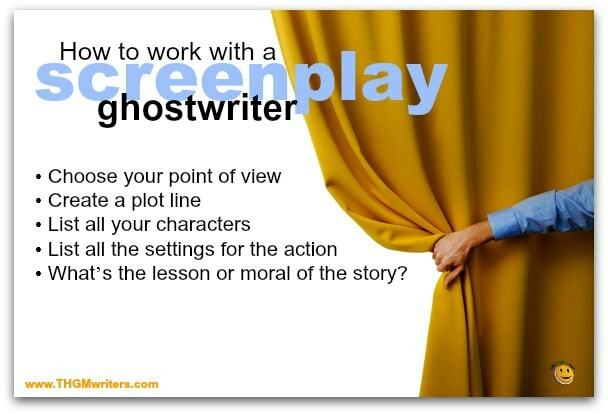 Your screenplay ghostwriter might offer a number of suggestions to improve the plot. It’s your choice to accept some, all or none of them. But it is to your advantage to listen closely and consider the ideas. One of the benefits of working with a professional screenwriter is that you get ideas from somebody who’s been there before. There are two things you should tell your screenplay writer about each of your characters. First, you should describe the character. What does each character look like? What does each character sound like? What are their various motivations? What are their relationships to each other? Second, how does the story change each character? This is a question mostly for your protagonist, but also for the chief villain and for the protagonist’s best buddy and/or love interest. A movie progresses generally along two parallel tracks. One is the plot. The other is the main character’s growth and evolution. A good scriptwriter can make characters do whatever you wish and evolve or grow in whatever way you like. Your job is to make sure that she fully understands what you expect form your characters. Every story can be told from a variety of points of view (POV). This is as true on the big screen as in a paperback novel. Your choice of protagonist will shape the flavor of the movie. Often there is more than one point of view, which will switch from scene to scene. This is an area to discuss with your ghostwriter. What’s the lesson or moral of the story? Every story has a lesson, whether reading or watching. When the audience gets up to ignore the final credits, your film will have changed their lives. This will happen whether you intend it to or not. How do you want your film to change people’s lives? You have the choice, and your ghostwriter can shape the story to make that change. Lessons don’t have to be overt, and they don’t have to come down like a hammer. A movie like The Matrix has many lessons, even if it’s camouflaged under the guide of a string of fight scenes. For a free quote on ghostwriting your next feature film or short vignette, tap or click the red button to the right. Our professional movie script writers are for hire right now, ready to create a memorable and salable movie script for you. Are you looking for a screenplay writer who can help your ideas jump off the page? Let us know how we can help you by completing the form on this page. I need help writing a screenplay. (ANSWER: No problem. That’s what our professional screenplay writers are for. Just provide the details for your story in the form on this page, and let us know what screenwriting help you need.